A witness said the crash occurred at the local wing of the airport close to the section were JET-A1, plane fuel, is stored. Fire service officials were seen evacuating the occupants of the plane. It is not yet clear if there was any casualty. 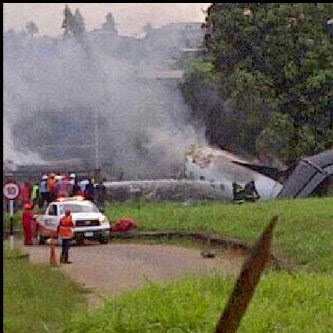 The plane is said to belong to Association Airline and was en route Akure. Plane is said to be carying the body of Late Former Ondo State Governor Olusegun Agagu. The spokesman of the Nigeria aviation agencies, Yakubu Datti, asked for more time to get details of the incident. Report states that the owner of MIC Casket, Mr. Okusanya was among the passengers and has been confirmed dead. Among the casualty are Agagu’s first son, who reports later say survived and Chief Olu Falae’s first son, Femi Falae. Repirts says 15 people have died in the plane crash that occured this morning and 6 survived. Earlier report put the total figure of the flight passenger at 20. We would give you update soon as we get them. The Associated airline’s blackbox has been found and handed over to the accident investigation board. The plane was said to have crashed immediately after take-off from the Lagos. “Emergency rescue operations commenced immediately by a combined team of Fire Service and security personnel .